Without meat and dairy consumption, global farmland use could be reduced by more than 75%. 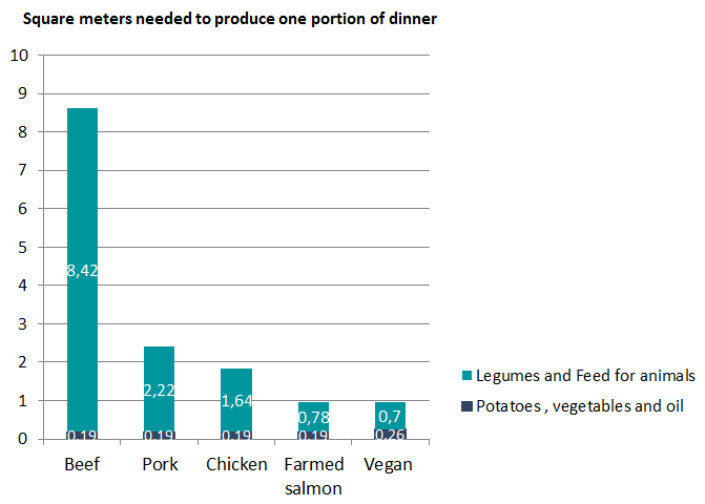 What about farmed salmon, where a large part of feed comes from agriculture, e.g. soy. Should we all become vegans? Two interesting recent reports address this question. One is a comprehensive study by Poore and Nemecek published in Science. Another is a study (in Norwegian) by the NGO Future in Our Hands (FIOH). What we eat really has an impact, not only on our health, but on the health of our planet. In an article in the Guardian Joseph Poore of the University of Oxford, UK explained that “a vegan diet is probably the single biggest way to reduce your impact on planet Earth, not just greenhouse gases, but global acidification, eutrophication, land use and water use”. “It is far bigger than cutting down on your flights or buying an electric car,” he continued, as the latter changes only cut greenhouse gas emissions.